New Zealand claimed regional glory when they put an end to Papua New Guinea’s dreams of an historic first title following a penalty shootout during the final of the OFC Nations Cup at Sir John Guise Stadium in Port Moresby. 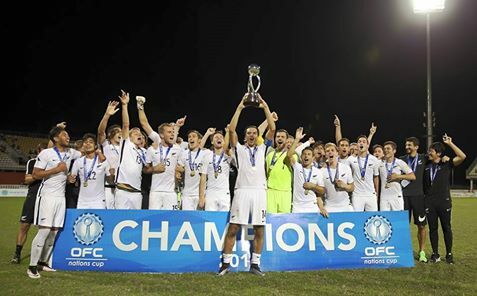 It was a history-equaling victory for the All Whites as they claimed their fifth Oceania title to match former OFC Member Association Australia’s tally. “It was a difficult game, they put us to the sword today but we held our nerve at the end. But it was one of the toughest games I’ve been in,” an elated New Zealand captain Rory Fallon said. “It was very nerve-racking to be out there when they went on the counter attack but our whole team on defence was unreal today. It looked as difficult out there for the New Zealanders as their captain claimed with Papua New Guinea’s seemingly endless energy causing problems for the All Whites in all four corners of the pitch. New Zealand put pressure on their opponents from the outset with an early advance calling the defensive pairing of Alwin Komolong and younger brother Felix into action. The duo, along with wide defenders Daniel Joe and Koriak Upaiga covered the defensive third well, closing down the aerial attacks from New Zealand well, and preventing Bill Tuiloma’s long throws from causing too much trouble in the penalty area. In midfield the work rate was equally as high with captain David Muta playing with a cool head and plenty of experience, guiding the ball to his forwards and helping keep the likes of Michael McGlinchey and Monty Patterson from causing too many problems. New Zealand sounded an early warning with a couple of fouls early on catching the attention of Tahitian referee Norbert Hauata, however they were an opportunity for the Kiwis to assert their physicality and show their hosts that they were just as determined to claim the victory. Luke Adams was a standout in the back for the All Whites with very little escaping his attention, and whatever did was promptly dealt with by the outstanding Stefan Marinovic – the two players among the few who played every minute of every match in Port Moresby for New Zealand. Although Papua New Guinea dominated possession in the first half they struggled to get near enough to their opponents goal to really trouble them, managing just two shots in 45 minutes. But it was hardly much better at the other end with New Zealand restricted to just six attempts on goal themselves. Despite the best efforts of both sides it seemed goals weren’t on the agenda for the evening as they went through regulation time without a goal scored. The two sides then went through a further 30 minutes of extra-time as they each went in search of a winner and although there were some hairy moments at either end, neither side had the killer touch to put an end to the match. A last minute effort from substitute Marco Rojas was denied by keeper Ronald Warisan and proved the final action of the game ahead of a penalty shootout with the four-time champions and the debutant finalists left in a scoreless deadlock. It was nail-biting stuff as the players went through the motions of a penalty shootout taking the crowd packed into the stands at Sir John Guise Stadium on the rollercoaster ride right alongside them. In the end it seems experience paid off with the All Whites holding their nerve to slot four goals to Papua New Guinea’s two. Winning coach Anthony Hudson commended his team’s opponent for their performance but said his charges deserved the win. “Throughout the game I always believed we’d win, but when you get to penalties you just never know. With a hugely patriotic crowd behind his side and an outstanding 120 minutes played out on the pitch it was a disappointing end to the tournament for Papua New Guinea coach Flemming Serritslev. However he remains proud of what his side achieved against the giants of regional football. “Of course I’m proud of the players, I think they’ve had a very good tournament here on home soil,” he said. “But of course we also are very disappointed. When you are standing just in front of picking up the gold medal. So while hugely disappointed, like his counterpart Hudson, Serritslev was quick to acknowledge their opponent New Zealand. New Zealand’s victory sees them crowned Oceania champions and also sees them qualify for the 2017 FIFA Confederations Cup in Russia. In addition to their overall triumph, the performance of goalkeeper Stefan Marinovic was recognised in the individual awards as he picked up the OFC Nations Cup Golden Gloves award. New Caledonia captain Bertrand Kai made an appearance to collect the Fairplay Award on behalf of his team, before two Papua New Guinea players were awarded for their outstanding performances over the duration of the tournament. Striker Raymond Gunemba picked up the Golden Boot in recognition of his five goals in as many games. Captain David Muta was also an individual award winner, taking home the Golden Ball for his outstanding contribution to the team over the course of the competition.